We are huge magazine fans over here. We love finding them in the mailbox, reading them, playing detective with them, crafting with them, and learning with them. When they arrive in the day’s mail, it’s like a getting a little gift, just for you. 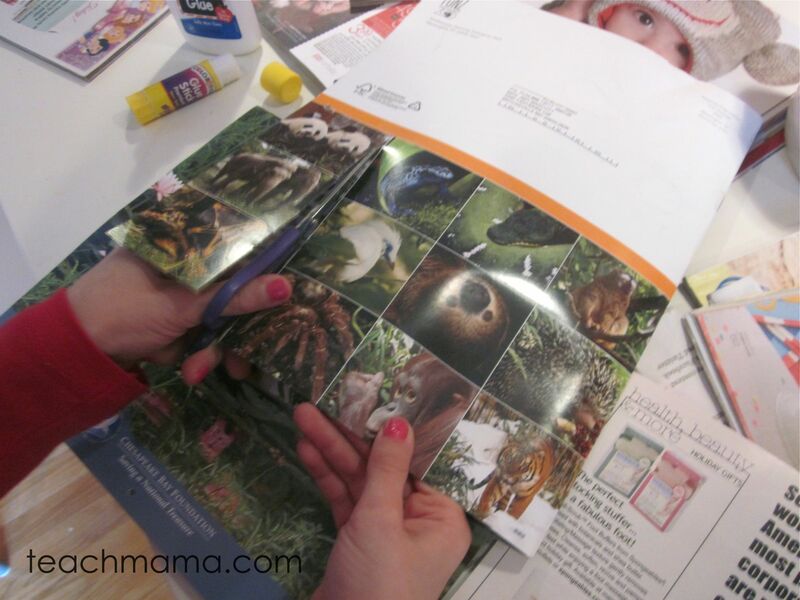 And when we sit down to read a magazine, it never feels like a chore; my kids–all of them–really love the freedom to flip through the pages, finding what interests them and moving past the ‘boring’ stuff. And when I give my kids the ‘go’ to use our magazines to cut, rip, tape, and use for anything they want, they always seem game. 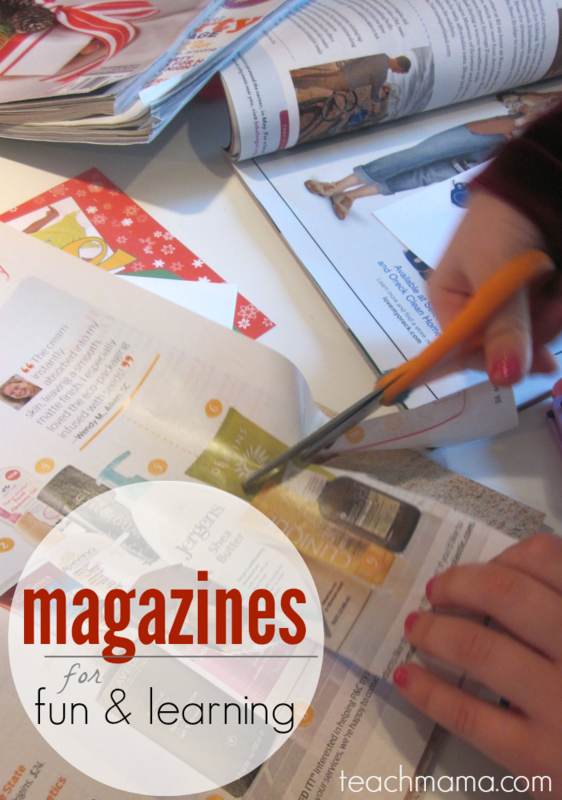 There are tons of creative, crafty, and fun ways to throw in some sneaky learning using magazines, but I’ve grabbed a few of my favorites to highlight because this time of year we always seem to end up with an over-abundance of magazines, mailers, and catalogs coming in each day. So if you do, too, then set some aside to use for some fun learning when the snow comes in January, February, and March. . .
Magazine Story Starters: I love having ‘idea cards’ on hand for anything, especially writing, drawing, or storytelling prompts. So if Maddy, Owen, and Cora are rammy, bored, or cranky, sometimes I’ll ask them to work on our Story Starters. 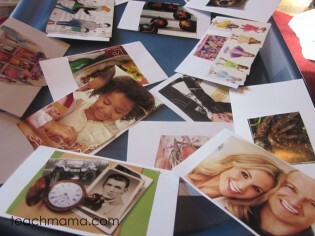 Story Starters are–very simply–interesting, thought-provoking, funny, beautiful, or unusual pictures on index cards. And they’re kept together in one happy place, together, for times when we need to kick-start our ideas. Maddy cuts some interesting animal photos. . .
. . . and Cora found a vacuum? Our Story Starter cards–thought-provoking, fun, unusual–and great to have on hand. 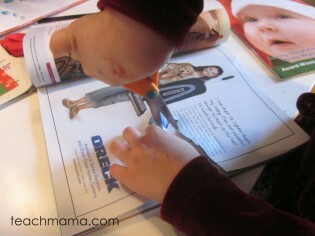 We usually just flip through the magazines, chatting and cutting pictures as we go. And we glue them onto cards. That’s it. Simple, fun, and gets the creative juices going. 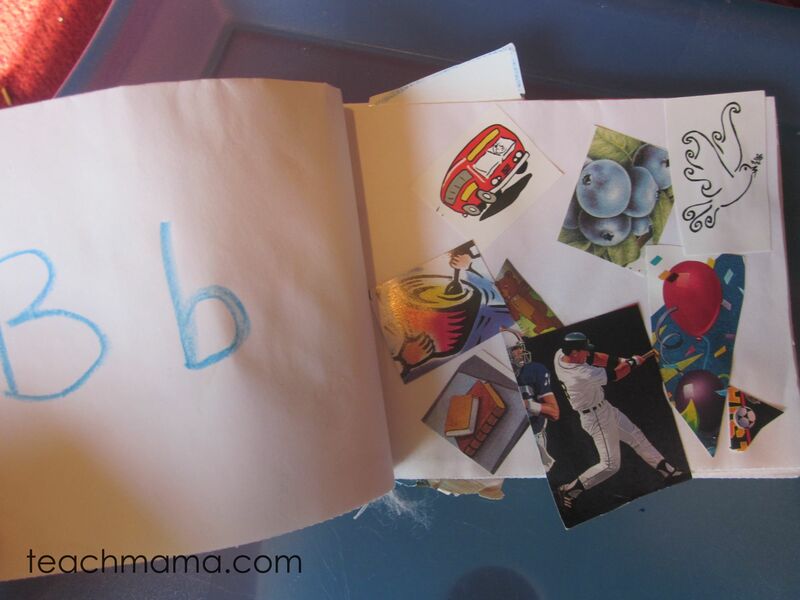 Alphabet Books: I loved creating Alphabet Books with my students as a way to really make the letters of the alphabet come alive. Maddy, Owen, and Cora started them a while back and only recently rediscovered them–only to find that the books were not completely finished. Alphabet Books are books that children create and personalize. That’s it. The good, old-fashioned ABC book with ‘Aa’ on the left page and pictures of a-words on the right side. Magazines are perfect for Alphabet Books because kids have so many photos at their fingertips. Alphabet Books are a fun and personal way to bring the letters of the alphabet to life. 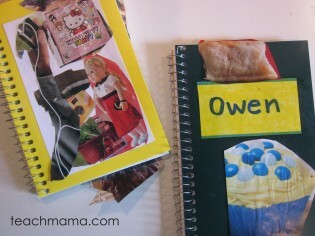 Mini-Me Collage: During our first-ever Smart Summer Challenge, we re-invented our Everyday Name Books by creating Mini-Me Collages on the covers. Mini Me Collages rock the house. We used magazines to cut out pictures of anything and everything that reminded them of themselves–objects they loved, colors they adored, foods they’d eat any day of the week, and places they dreamed of visiting. But they had to be tiny because the Mini Me collages had to fit on their tiny Everyday Name Books. And in my house, tiny = fun. Mini = magical. So I try to stick with the stuff that works. Magazine Hunt: Magazine Hunts are fun, sneaky ways of getting kids to ‘play’ with magazines, paying close attention to the text features that make magazines unique and different than other genres. 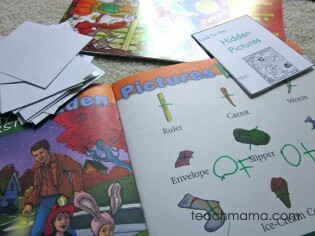 Cora works on her magazine hunt. . .
. . . following the prompt on the Magazine Hunt cards. The idea of a Magazine Hunt is simply to use a magazine–old or new, it doesn’t matter–along with the set of Magazine Hunt cards to ‘hunt’ for specific parts of the magazine. Not only do Magazine Hunts get kids to look at magazines in slightly different ways, but they also make reading a magazine a much more active process. My kids really love ’em. Which means I do, too. I have always loved magazines–as a child and even now as an adult–there’s something special about flipping through a magazine, reading the articles, and enjoying the photos, grabbing bits of this and that in a short sitting that I think some people (like my kids and I) really dig. I’m always looking for new ways to use mag’s since we have so many around here; if you are, too, please check out the Magazine Creative Challenge. A handful of my buddies are participating, and we’d love for you to join us! Please check out the participants’ Challenge posts and then link up your own! Many thanks to Rachelle Doorley of TinkerLab for organizing and hosting this Challenge (and many others!). Oh my I LOVE your alphabet books. How ADORABLE are they??? Love love love! I think we will make one with my son – a great way to reinforce letters and sounds. He loves finding things! Maggy–saved you from spam folder! 🙂 Thanks so much for writing and huge thanks for your kind words–means so much coming from you, one of my fave crafty-teacher-moms ever! What great ideas! My recycling bin is going to get a lot lighter! thanks so much, Stacey!! happy holidays to you and yours!! Amy–thanks so much! You are a gem for writing and can’t thank you enough for the positive feedback. Have a super holiday, my friend!! thank you so much, Katherine!! Have a great holiday! I love the magazine hunt idea! We just so happen to have a huge stack of High Fives and High lights. I’m printing the cards out right NOW! This will be perfect for that LONG Christmas break we are about to have. thank you, Jill! Let me know how it goes–and have a great holiday!! Great ideas! With all these ideas I will think twice before throwing out magazines! My daughter will have a lot of fun with the story starters! thank you thank you thank you Melissa! Let me know how it goes–can’t wait to hear about it!! i love all your ideas. I think next year when my toddler is a little bigger we will be doing the A B C idea. I also really loved the magazine hunt. That could help us when we are waiting at places like doctors offices. thank you so much, Laura!! totally appreciate your kind words, my friend!! Oh what a marvelous idea!!! Great job! thanks a ton, Michelle!! So grateful that you stopped by! we just may have to make these as storytelling prompts! momma runs out of ideas sometimes for those “mommy, tell me a story!” moments! Jen! Thank you thank you thank you! That means a ton coming from you, my friend!! Brilliant ideas, Amy! Especially loved the story starters. I’m all for using creative props for storytelling and other literacy activities. My daughter collaged a self-portrait with words from magazine cuttings! Learning so many ideas as I’m going around from blog to blog in today’s challenge! Rashmie!! YOU are so sweet–thanks for the kind words and support; you’re right, I learned a ton too, by looking at everyone’s ideas. What an awesome group!! thanks so much, Christie!! Totally appreciate your kind words!! Oh my goodness, Amy, you’ve outdone yourself! 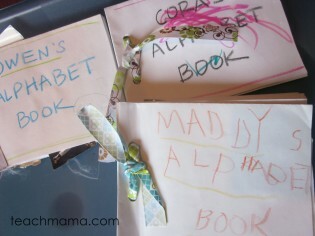 I LOVE all of these ideas, and I think my oldest child is ready to make an alphabet book and create some story starters. I can just picture us sitting down with a cup of tea/cocoa, chatting happily while we snip away. You’re fabulous! 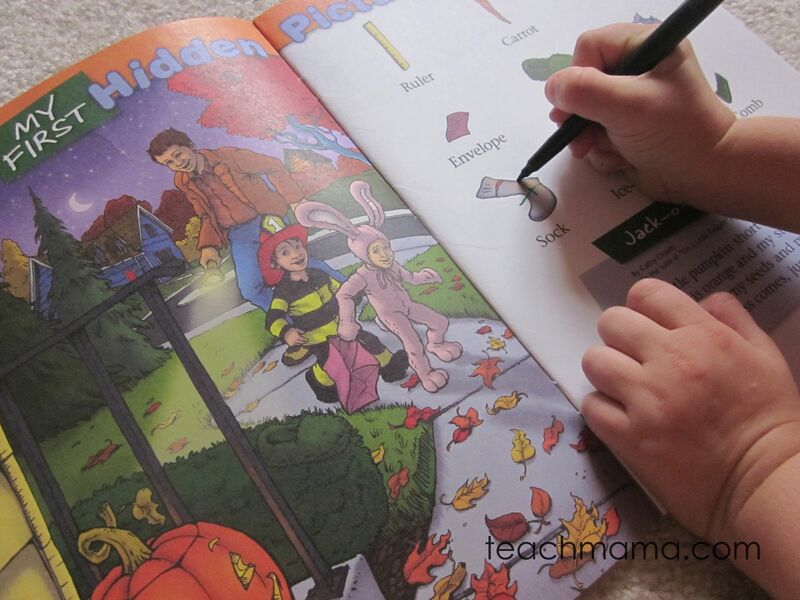 so clever – I love how you’ve inspired your kiddos to write and imagine!